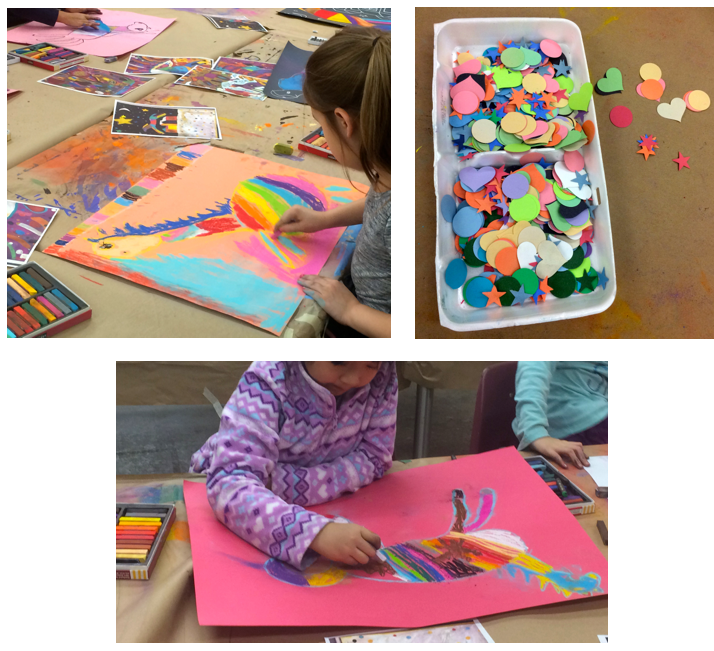 Littlechild’s foster mother recognized George’s talent at a very young age and lovingly encouraged him by providing him with art supplies and lessons. He went on to graduate from the Nova Scotia College of Art and Design in Halifax, Canada in 1988. He has also recently received his doctorate from the University of the Fraser Valley in BC. 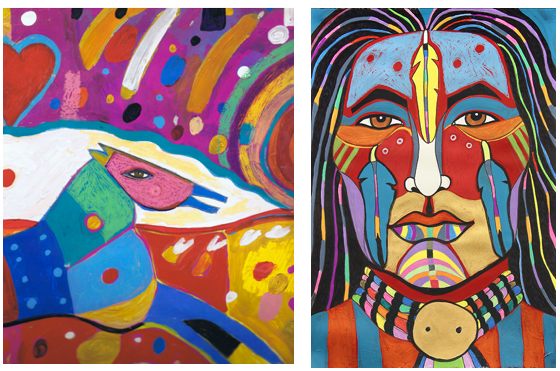 Many of Littlechild’s paintings depict the colourful faces of First Nation Canadians, sometimes adding collage from vintage photographs to further add to the painting’s story. He also sometimes features horses in his work. Some very beautiful examples of his horse paintings can be seen in his illustrations for the children’s book What’s the Most Beautiful Thing You Know About Horses? by Richard Van Camp. This humorous story is about an inquisitive boy from the North West territories who longs to know all there is about horses. Use of pattern and contrast to best effect. Attention to negative space through the adding of colour, pattern, and collaged pieces and details to the background. Composition and design; filling the paper and creating balance. Colour; adding bright colours all over our paper. 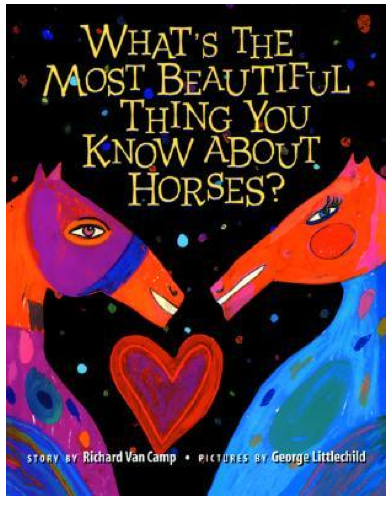 I usually start this project by reading from What’s the Most Beautiful Thing You Know About Horses? written by Richard Van Camp & illustrations by George Littlechild. Afterwards, we talk about how Littlechild’s work falls into both the realm of pop art and native art, how he incorporates drawing, painting, and collage in his work, and, how he makes his paintings pop with joy with his unselfconscious use of colour and symbolic details. I then do a drawing demo to illustrate how big I’d like the kids to make their own horses -emphasizing that realism is not as important as filling their paper with colour and interest. This, after all, is an art horse! 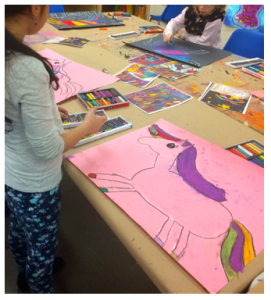 Working on a large piece of construction paper, the kids lightly draw the basic shape of their horse with a light-coloured chalk pastel. We like chalk pastels for the initial sketch because it forces us to work big but it’s also (partly) erasable. We first start by drawing the horse’s head in the upper right or left corner of our paper by drawing what I refer to as a ‘skinny hot-dog bun’. We create our neck by drawing two lines coming down from the bottom of the head shape tapering outwards as we go. 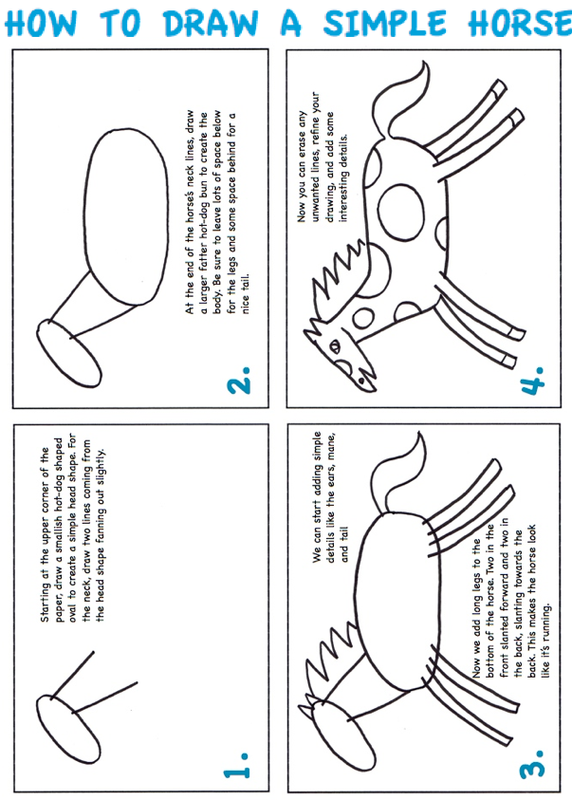 We’ll then draw our horse’s body by creating a larger and ‘slightly fatter hot-dog bun’. Next, we add long skinny legs with curved lines; two in the front and two in the back. We can now refine our drawing by, perhaps, slimming down our horse head etc. and adding the mane, tail, eyes, and hooves. Just be warned, you might see some unicorn horns popping up as well! 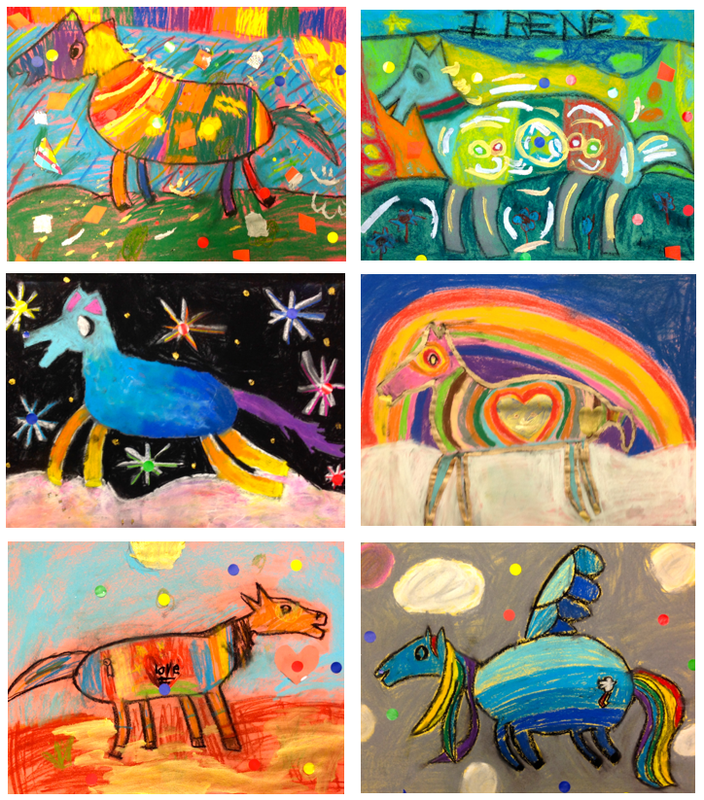 With the drawing all sorted out , we can then outline our horses with a dark coloured oil pastel. Now we switch to chalk pastels to colour our horse. 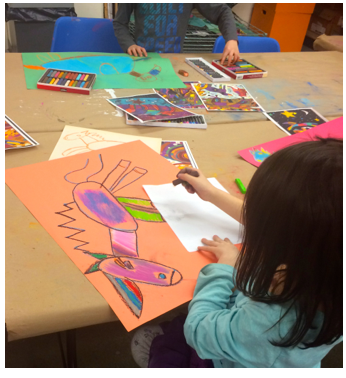 The kids are encouraged to create any colourful patterns of their choosing but asked to apply their colours boldly. Now for some collaging! From a selection of bright paper shapes, we’ll glue on colourful bits to both the horse and the background. I used shape punches and punched out some bright bits of paper for the kids to glue on. We then finish with some light touches of metallic gold tempura paint. Note: this project will also work well with liquid tempura paint instead of chalk pastels, it’s just a little more work!